What?… Good picture of the two of us??? A good picture of the two of us? You can dream about that… Reality? Mmmmm…??? Anyway, we were waiting for dinner! Pics and film of dinner are for tomorrow!! Now the good picture of the two of us??? Because I forbid you… otherwise!!! I start chewing on it… Mum says that I have to stop that and give her the bottle! No way, I carry the bottle high up in my tree! She can’t reach me here. I can play with it here! Oh, Mambo and little Sammeke want my botle too. Be careful, guys, go down! They think it is more interesting than my bottle? Dusty, Endora and Mauricee should see this… I make my bottle slide down!! Do you call me mum? We go home? New friend and… new beard! This afternoon we went to the dogpark! Nothing new of course! That’s what you think! Anyway, Cino and me we played… little bit away from my mum and his dad and far away from grandpa! But mum had the blinking box ready and she said she zoomed in! What on earth is that? A parcel for mum!… Coming from very far away! I should have known! I really should have known… She is a library-mum, my mum. So, in parcels, most of the time, well… you know! Yes, there is a book in this parcel too! Mum shows it from a little further away! 😉 I get all excited! There are friends on it, airedalefriends! Oh, beautiful dales! Mum, and can I have the cardboard now to play with? I did wait patiently, didn’t I? Aerem’s mum especially put cardboard around it for me, to play with! You understand that, don’t you? On special demand… Replay on another day! There is that fan of me in Berlin… She is a bit special: she comes from the States and lives in Germany now. She absolutely adores airedales, but the poor misses, she has not one of her own! Oh, I think that is a big pity! That’s why she adores me so much and I love her! She often writes me: on my story-page and on the tv-typing-machine-book! So when I asked to help me to surprise my mum… Remember, when I asked to break that record and then we broke two records??!!! She did help of course. And then she asked my help too! 🙂 Isn’t that great? Me, helping someone? I like it!! So, on very special demand, I asked my mum to help me out and to make another pawplunger-video, especially for my friend in Berlin! Strange!! !… Beach and sky are occupied! So we went to another part of the beach: other beach-cars with flags… 😦 Mum, it’s not safe here. And then, there were bizar birds in the air, making strange noises! So I barked. In the end we went into the dunes, we rest a bit and we made fototoot-selfies! 🙂 Returning home we met doggie-auntie Jara again! 🙂 What a walk! Lady in disguise?… Sand clown! My mum likes to imagine things! Really! You know what she says? Well, mum says I’m a real clown! How does that come? Easter and nice weather? This spring is really great! Yes, we went to the seaside for more than one day!! Imagine the excitement! grandpa, did you hear it?! But then!!! There was the huge thing in the middle of the huge beach. Mum did not put me on the leash so I could have a look long before her. The big thing is full of mussels, a real mussels-shop! hahahaha! Mum arrives and she is very surprised. Mussels are still fresh because she wanted to take one but it does not want to let loose. Mum says that this human thing must have been long in the sea because it became a mussel bed. Can I take one too? My dogness, that’s not easy! That’s why she allows me to try… Gggrrrr. Weather is fine, mum is not to work… sounds good, doesn’t it? Yes, we go to the dogpark this afternoon! Who will be there? No, mum, I don’t pull on the leash, you are dreaming that. Walk a little faster, will you?! Look, mum! There he is! I saw him as a puppy! 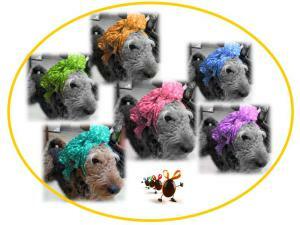 That’s labradoodle Mambo! Let’s party! This guy is ten months old and likes to play! His big sister acts like a real mum although she is only about 11 years old. Mum, look at that: she has her leash around her waist! And Mambo has a bizar collar! What do you say? It’s a gentle leader? I know, that’s for babies pulling on the leash too much! I never had one, had I mum? Mambo is a handsome fellow! Mum likes him too, he looks a bit like a giant schnauser and she loves them! We played, me and Mambo, I can tell you that, we were exhausted, both of us! And mum made pics and a video of us, she promised to show them on the tv-typing-machine. She wrote down on a paper where the little mum had to go and have a look! She will show it Mambo too, mum? Meet me and labradoodle Mambo, I mean: meet Mambo and me! Mum, he does not stay for the fototoot!